People often ask us how osteopathy can benefit babies and wonder how our approach in treating them compares with treating adults. Far and away the most common symptom we see babies for is unsettled behaviour. It’s the lower back pain of the baby world if you will. And it manifests in a variety of ways – most commonly crying and irritability, trouble getting wind out (either end), vomiting and sleep disturbance. Where a visit to the GP would likely result in a diagnosis of ‘colic’ or ‘reflux’ and a prescription, as osteopaths we find these diagnoses to be too broad, and commit ourselves to investigating and explaining WHY such symptoms are occurring. We feel it is our role as osteopaths to do the detective work. We take a thorough case history including details of the pregnancy, birth and postnatal period, and listen keenly to Mum who knows her baby best and is the expert on her child. Following a head to toe examination assessing overall wellness and health, milestone attainment, joints, neuromuscular status and primitive reflexes we then put our hands very gently on the baby, and listen to what the baby’s body tells us. We are also able to pick if there are any signs of serious issues that may need referral. We make a treatment plan tailored to the baby to unwind and resolve any tensions that may be palpable in the body and causing discomfort in some way. Treatment involves very subtle movements and light forces working with the baby’s natural physical tendency to seek balance, equilibrium and health. 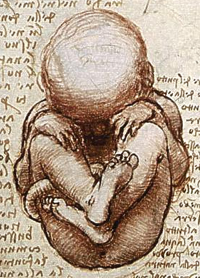 To give a few examples – a baby diagnosed by the GP with reflux may have had a rapid delivery and experienced a shock on transitioning to life on the outside, tightening their diaphragm and leading to increased regurgitation or vomiting; a baby who seems colicky may have been subjected to a long and difficult labour, perhaps with forceps or ventouse intervention, and therefore be experiencing pain; and a baby with sleep disturbance may have experienced compression in an odd position in the womb and struggle to get comfortable. It’s important to add here that every baby is different and tells a their own unique story. I must also add that currently any qualified osteopath may legally treat babies and children. At Kennington Osteopaths & Physiotherapy, we feel that expert knowledge of the specialised anatomy and physiology (and their associated problems) is essential to treating babies and children effectively and safely. Therefore both Andrea and I have completed a two-year postgraduate qualification at the Osteopathic Centre for Children. Osteoporosis – You ARE AT RISK unless you KNOW YOU AREN’T How does massage help PTSD, stress and anxiety?